From left: Past President Doug, Linda and Buggsy Bryant, Mischelle Adams, Steve Russell, Ben Smith, Robin Merchant, and President DJ. Five Old Town Rotarians have been recognized as Paul Harris Fellows. They were presented with their Paul Harris pins and medallions at the club's Thursday night meeting on July 26. 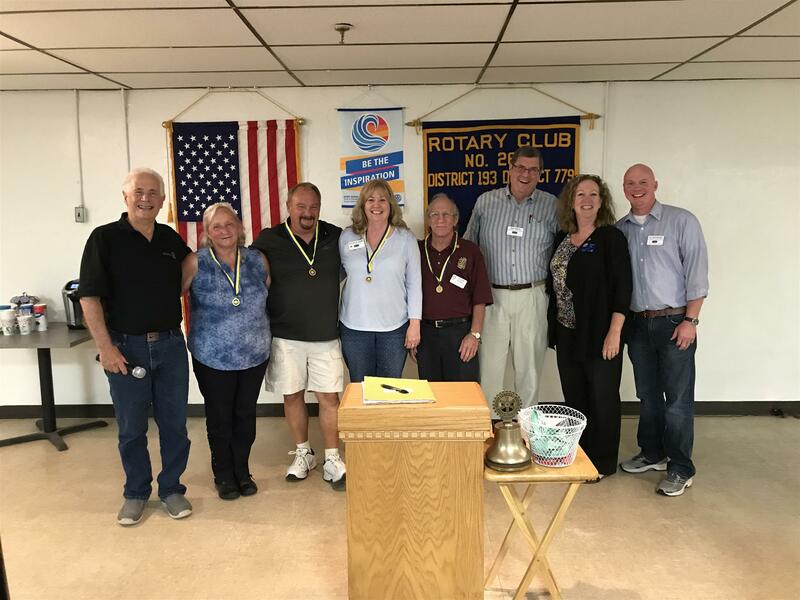 The Paul Harris Fellows are Mischelle Adams, club treasurer; Steve Russell, House committee chair; Robin Merchant, Assistant District Governor; and Linda and Buggsy Bryant--two club members who don't hold a formal office but get lots of different things done. The fellows were nominated by Past President Doug Marchio. Assisting in the presentation were President DJ Whitmore and Foundation Chair Ben Smith.